WASHINGTON -- Today, the U.S. Department of the Treasury announced that it had received an additional repayment from American International Group (AIG) of $2.15 billion funded through the proceeds from the previously announced sale of AIG's Nan Shan life insurance subsidiary. The proceeds were used to pay back the U.S. taxpayers' investment in AIG through the redemption of an equal portion of Treasury's preferred equity interests in AIA Aurora LLC, a subsidiary of AIG. "This is another important milestone in AIG's remarkable turnaround," said Assistant Secretary for Financial Stability Tim Massad. "We continue to make progress in recovering the taxpayers' investments in AIG." Okay, I'm just going to stop it right there, because when it comes to "AIG's remarkable turnaround," the devil is in the details. 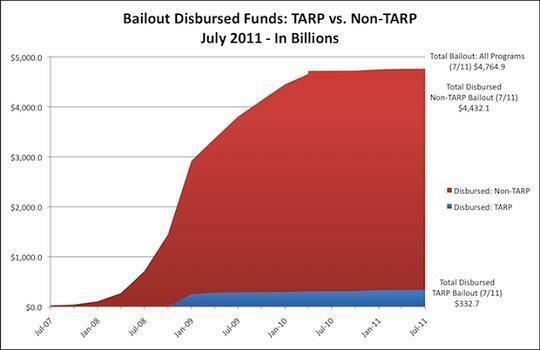 Time and time again we're asked to celebrate the success of TARP. Back in March, the good news was that, "The Treasury currently estimates that bank programs within TARP will ultimately provide a lifetime profit of nearly $20 billion to taxpayers." But this "profit" that the government has turned on the bailout of AIG rings pretty hollow in light of the four different restructurings of the original agreement that the government has acquiesced to since the fall of 2008. When the Fed first stepped in to prevent AIG from collapse in September 2008, the deal was actually pretty good -- it carried a punitively-high interest rate appropriate for a bailout, the CEO was dismissed and the company was going to sell itself off in parts, ending its too-big-to-fail status. If the government were turning a profit on a deal like this, it would indeed be good news. The trouble is, AIG's new management didn't break up the company very quickly. And even as it paid out lavish bonuses to its top-performing traders and executives, it couldn't make good on its interest payments to the government. So the feds stepped in again -- and again, and again -- throwing more money at the company, reducing the interest that it would pay taxpayers and eventually converting the government's loans to common stock, abandoning concrete repayment obligations in favor of whatever the stock might someday be worth. All the restructurings have succeeded in lowering the benchmark for success. An investor doesn't simply want to get his money back; he wants a suitable risk adjusted return. That would have been 11.5% for the first two years of the loan. AIG won't provide anything resembling either proper compensation or a Bagehot-style penalty rate. AIG may very well someday get to break-even with the U.S. If so, it's because the U.S. agreed to throw away tons of money on bonuses instead of pursuing a faster concrete break-up strategy, and because the U.S. allowed the company to repeatedly filch on its obligations to taxpayers. If the U.S. had simply enforced the original bailout deal, taxpayers would be hauling in a lot more. Per the Treasury Department's press release, "After today's repayment, the U.S. Government's remaining outstanding investment in AIG through Treasury is $51 billion." Ehhh. That makes it hard to celebrate taking back $2 billion, doesn't it? Well, this part is supposed to make it easier: "Overall, Treasury has received $313 billion in repayments and other income from its TARP investments -- more than 76 percent of the $412 billion disbursed under the program to date." If you're having trouble visualizing "far more money," here you go. A new study released today by the Center for Media and Democracy (CMD) shows that, despite rosy statements about the bailout's impending successful conclusion from federal government officials, $1.5 trillion of the $4.8 trillion in federal bailout funds are still outstanding. The analysis, presented in charts and an online table and program profiles, is based entirely on government records. This comprehensive assessment of the bailout goes beyond the relatively small Troubled Asset Relief Program (TARP) to look at the rest of the Treasury and Federal Reserve's multi-trillion dollar response to the financial crisis. It shows that, while the TARP bailout of Wall Street (not including the bailout of the auto industry) amounted to $330 billion, the government also quietly spent $4.4 trillion more in efforts to stave off the collapse of the financial and mortgage lending sectors. It cannot be stressed enough, the "bailout" and the "Troubled Asset Relief Program" are two very different things. When The Huffington Post spoke to Bottari back in March, she underscored this, saying, "TARP was never the big enchilada. It was always the Fed, and the Fed's exposure still remains in the housing sector, where they have pumped billions in an effort to prop up the housing market." The government's housing program -- which peaked at $1.6 trillion outstanding in July 2010 -- is aimed at keeping mortgage lending flowing by subsidizing deals Fannie Mae and Freddie Mac make with the banks. Treasury and the Federal Reserve's main approach has been to buy more than a trillion dollars worth of mortgage-backed securities from Fannie Mae and Freddie Mac so that the two government-sponsored enterprises can continue to purchase and bundle mortgages from the banks, which they sell to Fannie and Freddie at a profit. The banks also benefit from the hundreds of billions in direct loans the government has made to Fannie and Freddie, which the GSEs then turn around and make in insurance payouts to banks for mortgages that have gone bad. This massive effort is in stark contrast to the mere $2 billion the Treasury has spent to directly help homeowners stay in their homes via the widely criticized Home Affordable Mortgage Program (HAMP) program. With housing prices continuing to falter and the United States approaching 9.2 million foreclosure filings since the beginning of 2008, HAMP can be described as nothing less than an abject failure. "The Federal Reserve and the Treasury have spent $1.6 trillion in a bank-shot to save the mortgage lending market by using the same financial companies that got us into this mess," said Conor Kenny, lead author of the study. "That's more than 800 times what they've spent directly to keep homeowners in their houses, and the banks have made money off the whole thing." But AIG scraped together $2 billion to pay down what they owe, so pop champagne!